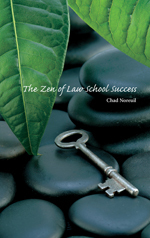 The Zen of Law School Success offers a comprehensive approach to succeeding in law school. Zen is about simplicity, balance, knowing your universe, knowing yourself, and staying focused on the path to enlightenment. Similarly, these principles should be the foundation for success in law school, and this book details how to put these principles into practice in order to maximize your ability to have a successful law school career. Like the Zen path to enlightenment, law school success is about balance (between studying and other aspects of life, as well as balancing your study time between subjects, outlining, etc. ), knowing your universe (knowing not only the subject matter tested, but knowing how the questions are constructed, knowing what to look for, etc. ), knowing yourself (what type of essay writer you are, what type of learner you are, what type of exam taker you are, etc. ), and staying focused on your path (when to study, what to do when you are stressed out, what to do when you don’t know a subject very well, etc.). In addition to offering a comprehensive approach to succeeding in law school, the book also offers practical advice for doing well during the classroom Socratic method, navigating the law school environment, managing law school stress, and getting a job after graduation. Moreover, the Zen of Law School Success focuses on doing well on final exams, including specific strategies and tips for both essay and multiple choice exams. The book includes many exercises and model answers that will benefit any law student and is an ideal resource for any law school Academic Achievement Program.